For the third month in a row we are lucky to see Canada included in Air France KLM's Promo Awards and this time we have two cities included! 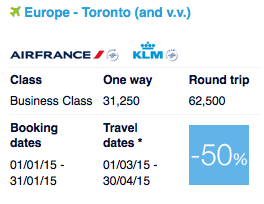 These award ticket deals are bookable as we speak and are good for award travel for March and April of 2015. 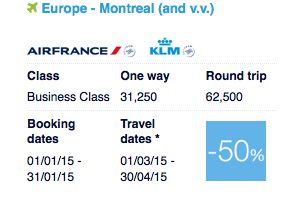 The offer this time is for 50% off Business Class between Montreal or Toronto and Europe on Air France or KLM. This is the type of offer everyone waits for. You can't complain by flying to Europe in style for only 62,500 miles round trip! Don't have the miles? You could always consider transferring Starpoints earned via the Starwood Preferred Guest Credit Card from American Express to Flying Blue. What are the promo awards? The promo awards are a discount of 25-50% off the regular Flying Blue mileage requirement for select Air France, KLM, Air Europa and Kenya Airways award tickets in select cabins. To take advantage of this deal you must book your promo award ticket by January 31st for travel between March 1st and April 30th, 2015. More details can be found here.